Review of TradeMiner - Does TradeMiner Actually Work? What if I could tell you of a stock that has risen 100% of the time, over the past 10 years, between February 3rd and February 9th? Would you want to know what that stock was? Or, what if you wanted to know when the best time of the year was to buy Apple for swing trading between 3 and 10 trading days? I'll tell you - it's October. 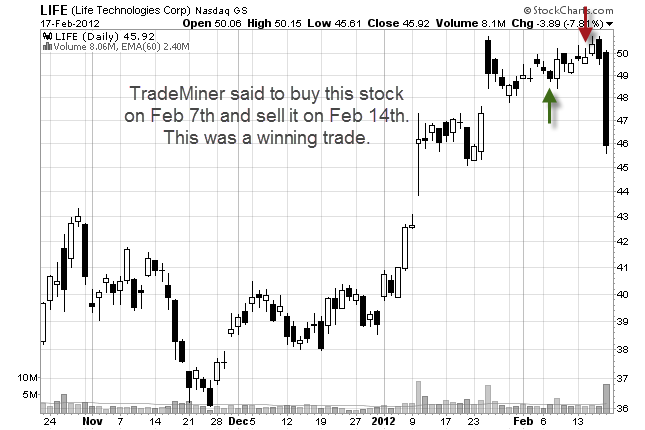 That is what TradeMiner does. TradeMiner is a software program that you download to your computer. It scans for historically profitable trends and market cycles in the past. The idea is that if a certain cycle, trend, or pattern has consistently shown up in the past, then it will likely repeat in the future. Let's take a look at the program and I'll show you how it works. The "Search" tab is where TradeMiner scans for stocks. You will see that I have told the program to scan for stocks with the following criteria (circled in red): Find all stocks during the month of March that win 100% of the time showing bullish setups. List all trades that last at least 3 trading days but no more than 10 days. Backtest at least 10 years. The scores three most important criteria are which markets make the most amount of money in the least amount of time, with the least amount of risk. At the bottom of the screen you will see the trade history for the selected trade (circled in blue). After you have mined for stock trends, then you can select the stocks that you want and add them to your portfolio (second tab). Yes. But you have to understand what this software program is - and what it is not. 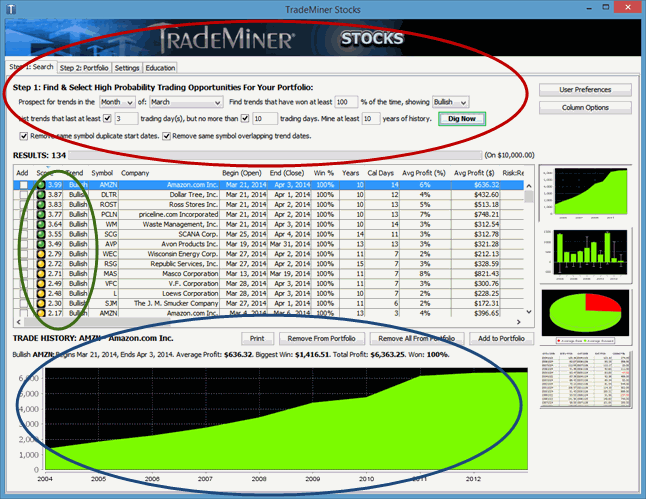 TradeMiner is a research tool - not a trading system. You can use this tool to increase the odds of a trade but let's get real: Just because a stock followed a certain pattern in the past does not mean that it will repeat with 100% certainty in the future. If a program like that existed, no one would sell it. They would sit in a hammock in the Caribbean drinking margaritas with a laptop making millions of dollars! This program does exactly what it says it does. If finds consistent patterns in the past and you can use those patterns to your advantage. Remember that all of these buy and sell signals are generated by what these stocks did in the past on those dates. The best part about TradeMiner is that there are no monthly data subscription fees. Yeah! I hate monthly fees. Another thing I like about TradeMiner is how fast the program is. It's super fast! It only takes a few seconds to find trading opportunities. But there are a few things I don't like. The first thing is that there is no way to scan by price. So, for example I can't tell the program to only return stocks between, say, 10 and 40 dollars. I can sort by price, just not scan by price. Update 2012:You can now scan by price by clicking on the settings tab and highlighting, then selecting the price range that you want to scan. they are a relatively new addition to the stock market, and because of that, they dont have much history to work with. Update 2012: TradeMiner now lists some of the most active ETF's by volume. Click on 'Exchange Traded Funds' from the drop-down menu in the settings section. The third thing is that there are no stock charts within the program. 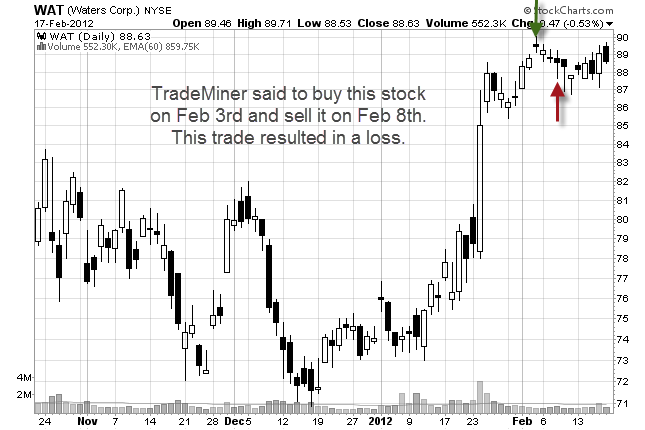 It would be a nice feature to click a button and it show me a stock chart for the selected trade. This seems to me like an obvious feature that is missing. Update 2014: You can now double-click on any stock and it will pull up a stock chart. Finally! How would swing traders use TradeMiner? I think the best way for swing traders to use TradeMiner is to run a scan for the month and add all of the stocks that it returns to a watch list. Then find out the dates the stock has been profitable in the past (the buy and sell signals). 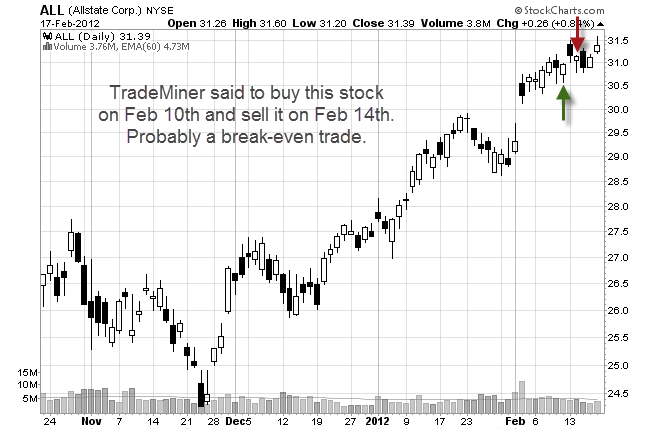 On those dates, look for trading setups on the daily chart. If you find something that you like, then you might consider trading it. But I wouldn't just blindly buy or sell a stock because the program tells you to! You should buy and sell stocks based on your own trading strategy. 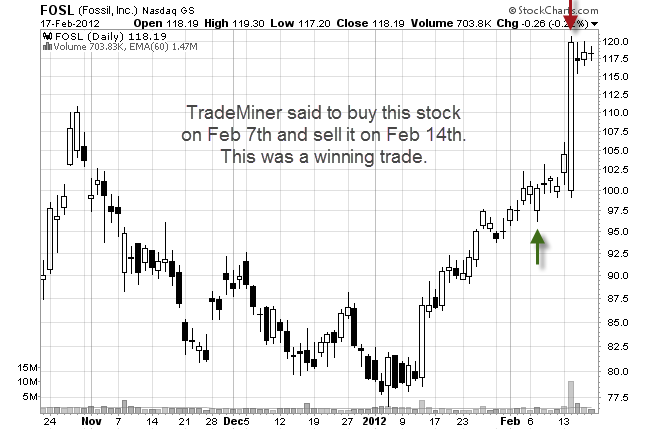 What I like to do is use TradeMiner to help me identify a stock that has been bullish/bearish during a specific time frame, and then use that information to make technical trading decisions. Yes. There is a really informative getting started video that explains how to use the program. They have a PDF manual, webinars, q&a page, and audio interviews. You won't have a hard time figuring out how to use the software program. It's actually very simple to use and intuitive. 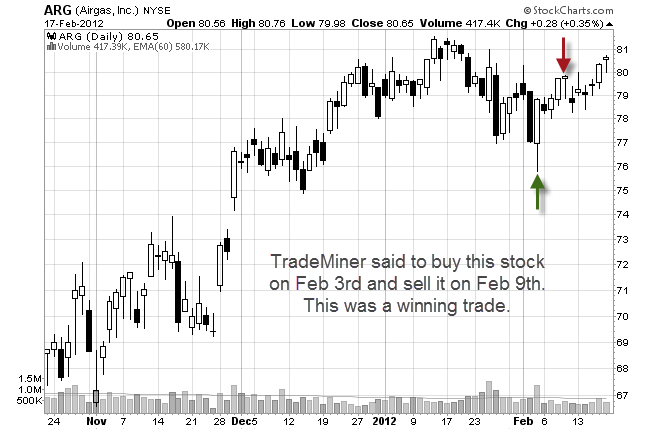 TradeMiner does not offer a trial version but there is a 60 day money back guarantee. It works on a PC, Mac, or Linux and is available for stocks, futures or forex. The cost is $97 and each year they will contact you to see if you want to update the data cube. TradeMiner is a great software program. It is an excellent tool to use in your trading if you use the program for what it was intended. But, if you think that you will download this program and start making millions in the stock market then you will be disappointed. Because no software program does that. Click here to visit the official TradeMiner website.